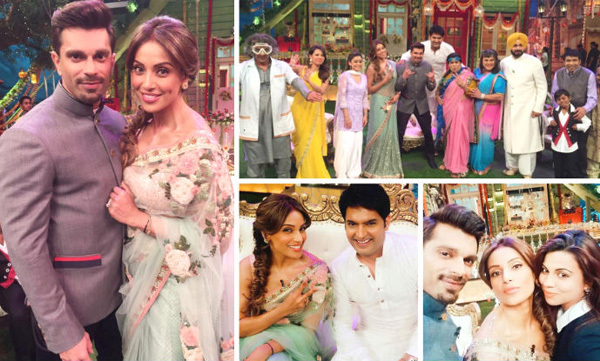 Much in love and newly married couple Karan Singh Grover and Bipasha Basu made their first on-screen appearance on TV's most popular show 'The Kapil Sharma Show'. Bipasha was dressed in a gorgeous Sabyasachi sari, while Karan look stunning in his suave look. The couple took to Instagram and shared images from the show. During the show Bipasha said, "Karan sings really well and writes songs as well since the beginning. I feel good about it. At the wedding, he sang three of my favourite songs and performed with the band. That was the best surprise for me ever. My sisters started crying when he started singing. It was quite romantic." Bipasha also shared a video in which Kapil is seen singing, Bipasha then asked Karan to sing, and the actor then attempted a bit of rap. On this Kapil said, "You changed so much after marriage?" If you watch the video and images, Bipasha and Karan seem to have spent a good time on the show with fun laughter and making memories. Karan Singh Grover and Bipasha Basu got married on 30 April, they were also potted enjoying their honeymoon in Maldives in pictures that have gone viral on social media.